Domain Holdings had a strong Q4 2015. The results of our continuing efforts to develop a strong foundation for the Domain Holdings and Flippa families in Q3 have continued to gain momentum into Q4, resulting in higher sales and more robust numbers than Q3 and Q2. As always, we will continue to develop ourselves internally to ensure continued growth and client satisfaction. Domain Holdings experienced growth across the board for Q4 2015. 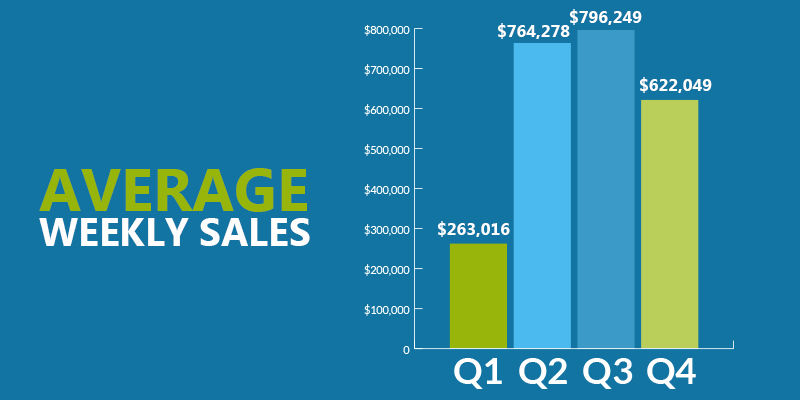 Our experienced brokerage team generated $1.82M more (40% increase) in sales in Q4 than in Q3. Our overall average sales price is up from $57,424 to $105,982, and our average sales per week increased by 40% from Q3 to Q4, surpassing $485,000. 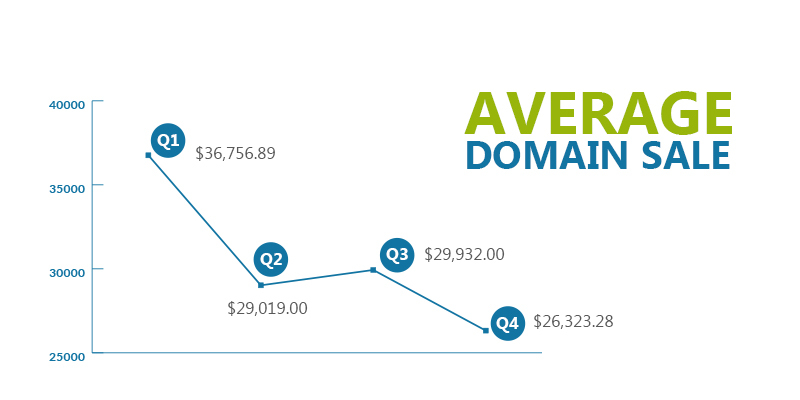 The overall average sales price (ASP) for domains in Q4 was $105,982, an increase of 84% from Q3. Although ASP fluctuates from quarter to quarter, Domain Holdings has seen continued growth in the overall ASP throughout the fiscal year, making Q4 among our highest numbers in the last eight quarters. 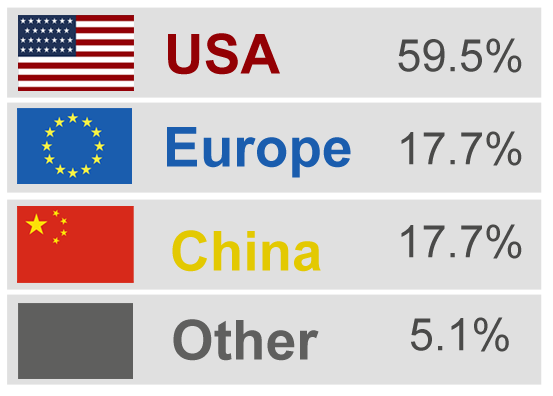 In Q4, The United States and China continue to be the two largest markets for Domain Holdings, accounting for 86% of total sales. Sales to the Chinese market increased from Q3, due their interest in domain names of up to 4L or 3N. 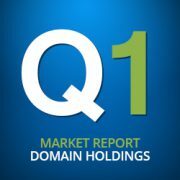 The .com domain continues to remain the market leader, accounting for 86% of our sales in Q4. However, interest in gTLDs continue to grow and constitute a larger part of our business. Certain gTLDs, such as .io are especially in demand, as they are very popular in the tech and startup sectors. Overall, Q4 was a success and an amazing end to a big year. Flippa’s acquisition of Domain Holdings has allowed us to build a solid foundation for future growth. We have increased our sales through our continued dedication to our existing clients (buy requests), secured more inventory, generated new relationships, matured pipelines, and launching new outbound marketing campaigns. In addition, Domain Holdings has expanded our team in size, function and experience in 2015. Our increased head count has allowed us to expand our service offerings, helping us to fulfill the needs of our existing clients, as well as the demands of a constantly growing client base. Please check out an article written by Michelle Miller who sat down with Mark Daniel, our Senior Domain Broker, as we gain insight into the journey which led him to where he is today as one of the top brokers in the industry. In this article, Mark brings us into his domain – life before Domain Holdings, his approach, and his keys to success. We are excited for what 2016 has in store! Thank you for reading! 2015 continues to be a strong year for Domain Holdings, though the numbers might not reflect that strength. Heading into Q4, our momentum and sales are stronger than ever. Accompanying our merge with Flippa, we have made several sizable changes in Q3. Our focus is on ensuring that we have a rock solid foundation to promote increased growth, stability, and client services. Our team is the base of this foundation, and the addition of domain industry veterans to the Domain Holdings and Flippa family has been a big first step. Our collective team has more than a century of domain experience with more than $250 Million closed in domain sales. Though that historical performance and experience is impressive, the most important attribute is that our experienced, dedicated team will always do the right thing, loves the domain industry, and is absolutely committed to the growth and solidity of Domain Holdings and Flippa. The overall average sales price remained relatively consistent from Q2 to Q3, coming in at $57,500. Based on the predicted Q4 pipeline, expectations are that the overall ASP will continue to climb. 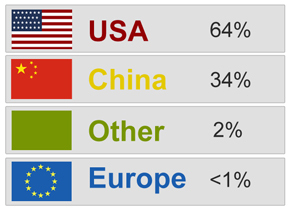 Looking back to Q2, Europe only accounted for less than 1% of sales. During Q3 however, the European market skyrocketed, accounting for 17.7% of all sales, rising to match the growing Chinese market. In Q4 we will continue to see strong demand for numeric and acronym domains from the Chinese investors. We are expecting to see the percentage to increase due to the recent interest for LLLL.com domains. As expected, .com’s are still dominating the market, but we have notice a growing trend with gTLD’s such as .io constituting a larger share of our business. In a one certain case, we sold a notable 1-word .io domain name in the high five-figure range to an end user. The .io extension in particular seems to be gaining more momentum. As gTLD market continues to grow, it has peaked many people’s interest in buying different gTLDs for brand protection or marketing campaign. Domain Holdings would like to share an in depth Search Engine Marketing report on .Com vs. New GTLD, conducted by Bill Hartzer from GlobeRunner.com earlier this year. The study demonstrated whether or not the new gTLDs would be performing better, worse, or same as .com domains. Bill’s test result may be helpful to you in deciding if investing in gTLDS should be a part of your company’s brand protection and marketing campaign. A complete solution for all types of domains. The Domain Holding brokers can launch and represent private auctions via the Flippa platform (upon request), boosting awareness and driving more offers to the table. Custom research and highly targeted business intelligence reports. Our domain analysts research all potential end users and prospective buyers, providing a comprehensive analysis prior to broker outreach. Leveraging and collaborating with the Flippa digital asset brokerage team. Flippa is #1 in the world at selling websites, recently expanding into the mobile apps space, and boasting a robust team of website and mobile app brokers. This far reaching broker network gives us access to an even greater amount of buyers and end-users across the all-inclusive digital asset landscape. With our increased focus on backend new technology and a stronger operational foundation, the future for Domain Holdings is bright. We look forward to sharing more updates in the coming months. Be sure to talk to our brokerage team to learn more about the new features noted above. We also would love to hear your feedback as we continue to focus on offering the most comprehensive services in the industry. Thank you for reading and hope to see you at NamesCon in January. 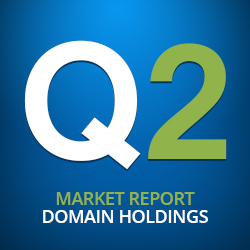 2015 continues to be a strong year for Domain Holdings, as we report our Q2 results. In addition to our sales success in Q2, Domain Holdings was acquired by Flippa, the #1 marketplace for buying and selling websites. Flippa, founded in 2009, has a robust technology driven team and marketplace platform that attracts numerous bids every minute of the day! Domain Holdings has one of the most respected and experienced brokerage teams in the domain industry, representing both large and small businesses secure their online brands. Combined, Flippa and Domain Holdings are expected to generated $70 million in sales over the next 12 months. Read more about the recent acquisition at DNJournal – http://www.dnjournal.com/archive/lowdown/2015/dailyposts/20150520.htm. Although we cannot disclose the details of most of our sales due to non-disclosure agreements, we’ve provided some averages and other sales data that may be helpful for domain investors, buyers, and sellers who are eager to learn more about the domain industry. In Q2 2015, we realized growth across the board. 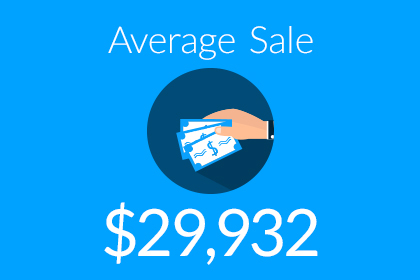 Our stellar brokerage team generated $1.39M more (29% increase) as compared to Q1. Our overall average sales price was up from $49,522 to $59,079 and our weekly sales average jumped by 29% exceeding $472,000 per week. As the overall average sales price (ASP) for domains can fluctuate from quarter to quarter, we have had two strong quarters of exceptionally high ASPs. Q2 was among our highest in the last 6 quarters. USA and China remain the largest two markets for Domain Holdings, accounting for 90% of all sales. In Q2 we continued to see a strong demand for number and acronym domains from the Chinese buyers. Short brandable domains also continue to be on the rise for the Chinese buyers. In this quarter, we are expecting the Chinese investor market will continue to increase despite the China staking a recent hit. While .com domains continue to remain the strongest segment of the marketplace, we have been receiving a lot more interest for gTLDs domains as we see more new extensions coming out for each quarter. We are happy to announce that we sold a 1-word .io domain for 6 figures to an end user in Q2 as we continue to work with different end users who are interested in investing in premium .io domain names, as well as other gTLD assets. It’s no surprise that 1-word domains are at the top of the leaderboard, with an overall average sales price of $63,500. Acronyms were a close second, selling for just $500 less, followed by 2-word domains. Hope you enjoy the data we just share. We are excited and proud of our accomplishments in Q2 and to be a part of the Flippa team. We are looking forward to sharing even more data in Q3. 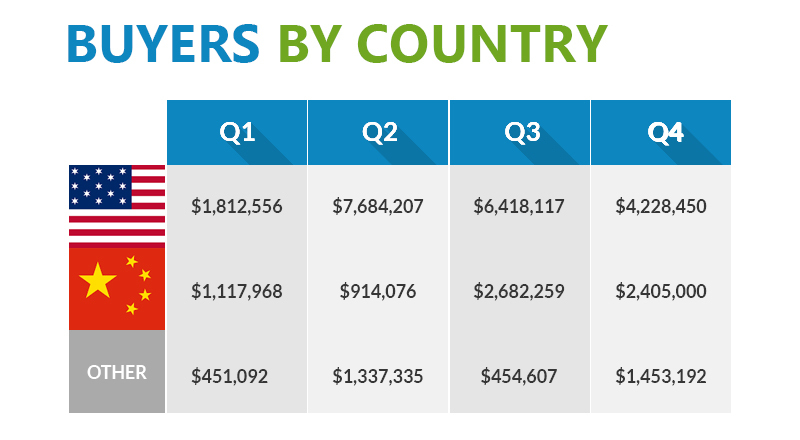 Domain Holdings is extremely proud to report our Q1 results showing $4.75MM in total domain name sales. We are off to a great start for 2015 and while most transactions are protected under confidentiality agreements, we can share the collective data to help investors understand trends, highlight interesting data points, and provide further insights into the domain industry. In Q1-2015, Domain Holdings managed to increase total sales, average weekly sales and average domain sales price per unit for the same period year over year. Our total sales and average weekly sales both realized a growth rate of 40%, while our average domain sale price per unit grew 35% from $36,757 to $49,522. This average unit price represents the largest in company’s history. The below chart illustrates the stark increase in average unit sales price for the period of Q1-2015. 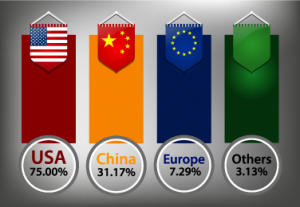 USA and China remain the largest two markets for Domain Holdings. In Q1, we saw a strong demand in numeric and letter domains from the Chinese market, particularly in the NL.com, LLN.com, and LN.com categories. Domain Holdings has also witnessed an increase in interest for .com brandable assets out of the Chinese investor markets. In Q2, we are expecting to see an increase percentage and sales for China due to the recent increase demand for LLL.com assets. Since .com domains remain the strongest segment of the marketplace, we do not expect to see a decline in sales any time soon. Activity within the ccTLD and gTLD domains has reached new highs, most likely as a result of all the marketing efforts around the publicity of the new gTLD launches. Demand for .net & .org assets continues at a steady pace. 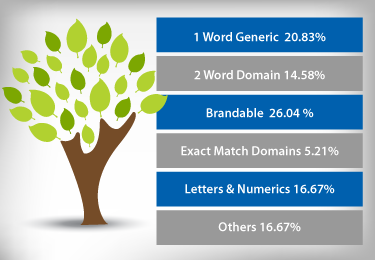 In similar fashion to our Q2-2014 report, brandable and 1 word .com domains continue to dominate our unit sales. In Q1-2015 we realized a 10% increase in brandable .com domain sales and a 5% increase in two word .com domain sales. One word .com domain transactions remain relatively stable. 75% of our brandable and one word generic .com buyers are end users, who may be more inclined to invest in their domain name and boost their brand equity. As Domain Holdings continues to expand our breadth and depth in the domain aftermarket, we use metrics such as relationship type to quantify our success. Strong sales with existing relationships indicates we are servicing our clients at a high level, new relationships means we are securing new sellers and buyers and prospecting well. For Q1-2015, there is a healthy ratio between new vs. existing relationships. Another metric we are proud of is our ability to consistently building our relationships through inbound leads and referrals. Domains in the LN and NL verticals will see a steady increase in value. Market for gTLD will grow and sales for aftermarket premium gTLDs will increase. New StartUp organizations, at Angel investment or Crowd-Funded level, will continue to gravitate to non-dot com extensions or a brandable company name for more favorable initial URL acquisition costs. Popular StartUp non-dot com extensions will continue to be .io, .co and .me. Revenue positive StartUps in later round funding will continue to upgrade their domains to the preferred .com extension and unify their digital brands. Overall, Q1 was a great success and had an amazing start. We are expecting to have another solid quarter by increasing our sales through continued dedication to our existing clients (buy requests), secure more inventory, new relationship generation, maturing pipelines and new marketing campaigns. Domain holdings has expanded our team in size, function and experience in 2015 and looks to increase the head count and service offerings to help support the increased demands of our existing clients and new demands required by a client base that is growing weekly. Hope you enjoy the data we just share. We are extremely proud of our accomplishments in Q1 and look forward to sharing even more data next quarter. Stay tuned. ** Does not include managed auction sales where the buyer was unknown. 2014 was a very exciting year for us. We ended the year with almost two $10 Million quarters and showed consistent growth every quarter in terms of units. Domain Holdings also ended the year with a much higher quality of exclusive inventory for sale including many owned by corporate clients never listed for sale before. In Q2 we started reporting our Average Domain Sale by discounting the top 5 and bottom 5 sales. As you can see by the chart below we had a very consistent average weekly sales range over the next 3 quarters. In 2014 Domain Holdings managed to increased our average weekly sales by well over 100%. We started the year with $263,016 in average weekly sales in Q1 and ended with $622,049 in Q4. 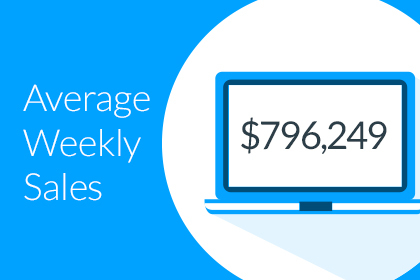 The quarters in between were closer to $800,000 per week. The largest 2 markets for Domain Holdings continues to be USA and China. We have seen a continued strong interest in numeric and LL.com domains from the China market during Q4 but also a smaller supply at wholesale prices compared to what was available in Q2 and Q3. What is interesting is the China market interest has expanded greatly to premium .com’s using a wide set of criteria and huge industry end user sales like 360.com (reportedly sold to 360.cn for $17,000,000 from Vodaphone) continue to drive heavy interest from the Chinese market. Long tail domains or short domains? 77% of our sales in Q4 were 10 characters or less. 2014 Overall was an amazing year for Domain Holdings and we expect 2015 to be even bigger. So far this year we have secured many amazing names under exclusivity including Adopting.com, Give.com, Taiwan.com and the ultra exclusive HongKong.com. Further tightening of quality standards for defining a premium domain name. Overall we are very bullish on 2015 and the future of domain name values in general. We look forward to sharing this data every quarter and hope to see you this year! Domain Holdings is extremely proud to announce our Q3 sales report showing another quarter with almost $10,000,000 USD in sales. While our top line number was slightly down (-3.8%) the number of transactions were up 7.8% and our largest deal was $2.7 Million versus $5.0 Million in Q2 showing a much healthier overall diversity in sales. Our Q3 sales saw a huge increase in buyers from the China market including both end users and investors. In Q2 only 9.2% of our sales were conducted with China buyers versus 28.1% in Q3. This is a staggering 300% + increase and re-emphasizes the importance of the China market to the domain industry. Q3 weekly sales averaged $796,249 vs. $764,278 in Q2 – representing a 4.18% increase quarter over quarter. This weekly average represented a strong summer for sales and continued strengthening of our relationships across key verticals including the start up community, big brands, agencies and the China market. We also expanded our custom portfolio management in Q3 for large owners of premium domains increasing our available exclusive premium inventory. As a premium domain name brokerage firm our focus is on quality relationships and quality inventory. While the average sale from some companies is much less its important to note that we do not have a marketplace or even our own O&O (owned and operated) inventory. This allows us a geniune focus on premium domain name sales and/or specific buyer requests which removes most of the smaller inventory sales. In calculating our average sale we removed the top 5 sales and bottom 5 sales to help provide a more accurate overall picture of our performance. Our average sale increased by 3.15% to $29,932 in Q3 representing a very strong average sale and further verification that the average cost of a premium domain is increasing. The vast majority of our sales are confidential and this is a trade off we have to make when dealing with larger transactions. However there are certain trends we can show without identifying any specific transactions and/or parties. This quarter we are introducing a month over month chart to make our sales history more visual and also provide some insight into the range of our highest sales. One big take away from Q3 results was the overall contribution of .com sales. 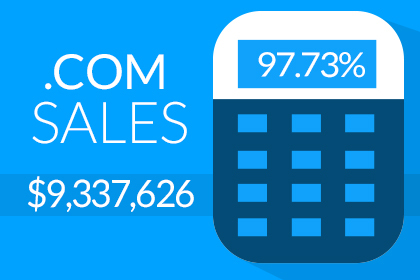 97.73% of our sales were .com domains. One major note is we have seen more offers on new GTLD’s this quarter than ever before and the demand for both premium .com’s and new GTLD’s seems to be increasing. The new GTLD domains are still finding price points primarily due to the short period since their introduction. We fully expect the ratio of .com sales will stay a significant portion of our business but also decrease slightly as markets move to incorporate the wealth of options available to people as new GTLD’s continue to gain traction and adoption in the aftermarket. 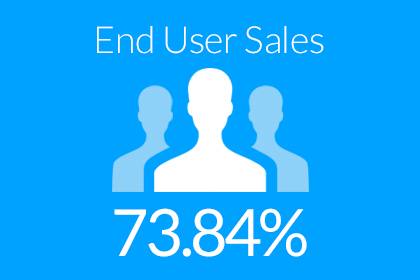 End user sales in Q3 accounted for 73.84% of all sales. While this number was down slightly from 79.21% in Q2 this actually represents an overall increase in end user sales due to a large sale in Q2. This number is certainly in line with our company objectives and continues to demonstrate our commitment to putting domains in the hands of people who will best use them. Our biggest success factor here is the quarter over quarter increase in buyer requests and referrals. These account for a much larger percentage of our business every quarter reaffirming our committed dedication to client relationships. Q3 activity on the surface was down with 53,285 emails (-25.37%) and 6,722 phone calls (-43.28%) but this was purely due to increased efficiency by our brokers and technology. A couple key takeaways can be made from the Q3 activity report however. (1) We invested in more technology during Q3 improving our data abilities for inventory management and lead generation. (2) Most of our brokers have been with Domain Holdings for over a year reducing the learning curve for newer hires. (3) Greater specific buy requests which reduce the amount of targeted outreach to potential end users. There is already a buyer and a specific asset is requested. Overall, it takes a lot of communication to make a sale. Simply based on the recorded volume of call and emails we averaged 59 calls and at least 480 emails per sale. These numbers are much higher when you include other forms of communication. The difference in non-recorded events wasn’t deemed significant enough to account for the total activity drop. With back to back quarters of nearly $10 Million each there is no doubt we certainly we have this mark in mind to break in Q4 and the market for premium domains doesn’t seem to be slowing at all. If anything, we continue to see a tightening of what is considered a “premium domain” and much higher values placed on acquiring the perfect domain by end users. Overall our projections were pretty solid for Q3 and over the next few months we expect a continuation of the same projections. I sincerely hope you enjoy the data we can share. We are extremely proud to be part of such a great industry and look forward to sharing even more data next quarter. Signed several exclusive corporate deals to handle existing inventory from of some of the world’s most notable brands. Invested thousands of dollars on further sales and negotiation training for our brokers and tools to help refine our outbound sales approach. While we celebrate our success in this report we should also look beyond the numbers and note that the value of premium domain names are growing due to the combined efforts of the industry and greater public awareness. From the success of the new GTLD’s to the millions of new dollars being invested in promoting existing options there never has been a time with such extensive global marketing finally supporting the industry we love so much. View the full Q2 report below or download the PDF version here. The rest of 2014 promises to be an incredible year and I hope you enjoy the data we can share. We are extremely proud to be part of this industry and look forward to reporting even higher sales next quarter. 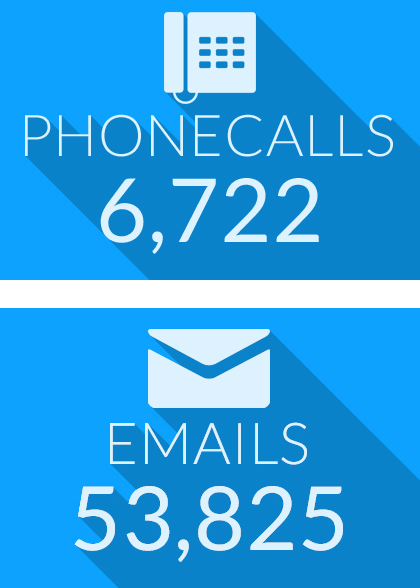 Our team made over 10,000 phone calls and 60,000+ targeted emails. In 2014 our biggest investment will continue to be in people and technology – if you know any good brokers we are hiring! Any questions or comments please contact us – a PDF copy of this report is also available here. Thank you again to everybody who has trusted us with their business and we look forward to even better quarters ahead.